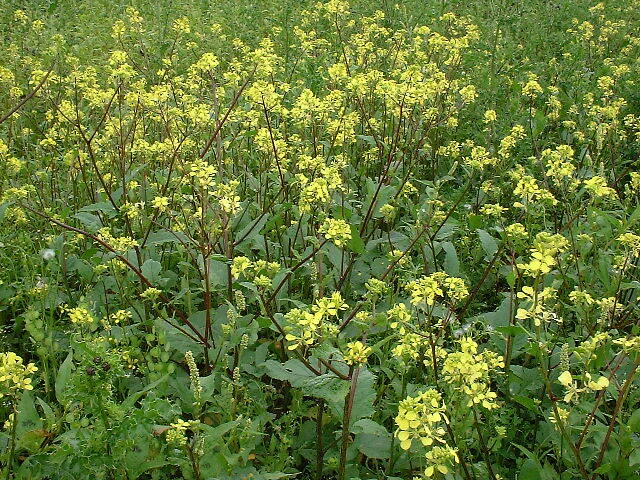 Charlock (Sinapis arvensis L.), a widespread annual weed, is a particular problem in spring-sown crops and can cause serious infestation of winter arable crops. It is especially prevalent on clay and heavy soil and calcareous loams. This leaflet on the control of charlock, produced by Garden Organic (formerly HDRA) as part of the Organic Weed Management Project, OF0315, provides a brief overview of a variety of weed control methods to manage it. It covers biology, persistence and spread, ways it can be prevented, and direct control options. Charlock seedlings generally emerge from October to July, with a peak in March-April. Peas and lupins are very susceptible to charlock. Oats are more competitive than other cereals. Delaying sowing and using a stale seedbed. Sowing a spring cereal earlier or a winter crop later. Harrowing of cereals and hoeing of root crops to help reduce a bad infestation. Where land is infested with charlock, cultivating the soil at regular intervals to stimulate and kill successive flushes of charlock seedlings. Stubble cleaning - cultivating surface soil no deeper than 5 cm and repeating at 14-day intervals. As directed on the leaflet, you can find more detailed information on Garden Organic's 'Organic weed management' pages.